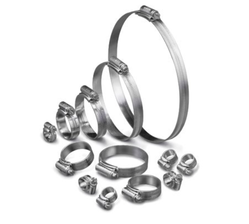 We are engaged in manufacturing and exporting a superior quality range of Hose Clips. The clips offered by us are manufactured as per the requirements of our clients using high-grade raw material and advanced technology. Moreover, these clips are known for their features like durability, corrosion resistance and high strength. We offer these clips in various sizes and specifications to meet the variegated requirements of our respected clients in an efficient manner. We are into manufacturing and exporting a superior quality range of Mini Hose Clips. These clips are manufactured with captive nuts and are suited for petrol pipe, fuel hose, vacuum hose, airline hose and PVC tubings. With the of sleeves or coatings that are available at the pipe holding area, help in offering flexibility in fastening. This also helps in preventing penetrating band edges in the pipe or in the item, which is holding and clamping. By getting an extra washer spot welded at the screw fixing area, these clips can be specially reinforced. Our firm is engaged in manufacturing and exporting a wide range of Steel Hose Clips. These clips are manufactured using a high-grade raw material, which is procured from the certified vendors of the market. Moreover, clients can avail these clips in various sizes and specifications as per their specific requirements. We also offer customized products to the clients as per their specific requirements. Owing to our extended vendor base, we are able to deliver the quality range of ZEN hose clamp to our customers. these clamps are offered in various specifications as per the needs and requirements of the clients. We use of quality stainless steel and to manufacture these hose clamps.